All coolers are not created equal. 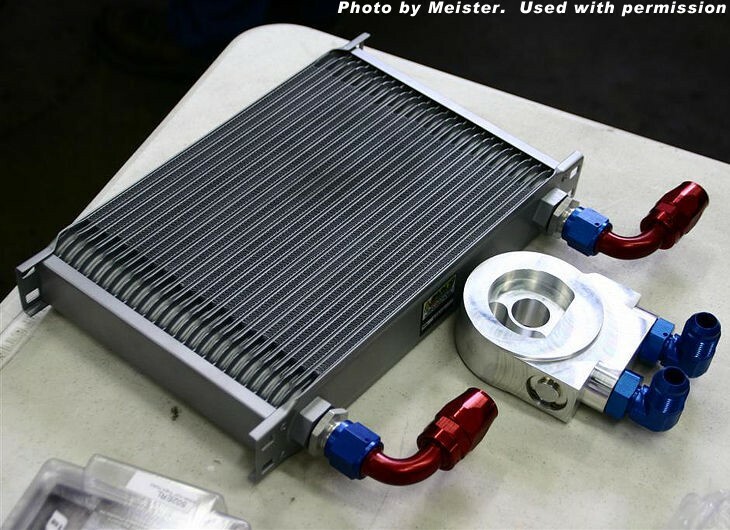 Many homebrewed solutions use tube-and-fin coolers, and while these are effective, their capacity to cool versus the space they take up is nothing like a good stacked-plate cooler, which explains why a quality stacked-plate cooler is so much more expensive. While they boast low-fluid restriction, tube-and-fin coolers have issues to consider with regard to maintaining fluid pressure. Likewise, there are cheap stacked-plate coolers on the market. You get what you pay for. 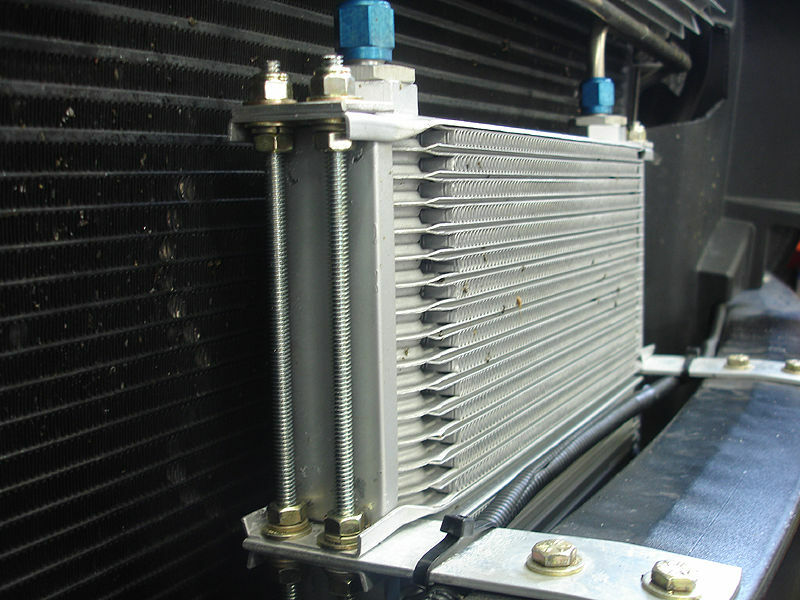 For example, internally a good stacked-plate cooler has some form of turbulator - a corrugated screen - inside each horizontal plate that slows the flow of oil through the cooler This ensures the oil is exposed to the cooling surface for a longer period of time. 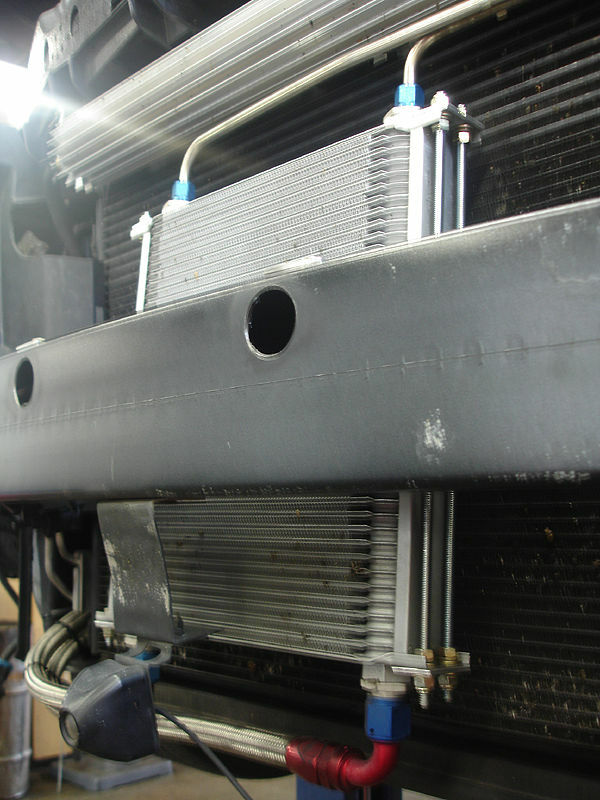 It also spreads the oil through the maximum internal surface area of the cooler. Without this, you have what looks on the outside to be a high-efficiency cooler but which has only a fraction of the capacity of a proper design. After looking at pretty much every type of cooler design, I found that the Earl's Plumbing line of stacked plate coolers had the highest btu/hr transfer rates of any cooler of this type, regardless of price. Given the size of the motor, space available and my intended use, a 25-row, 13"-wide cooler rated for 57,000 btu/hr was chosen. -10 AN fittings were selected as they give all of the flow we could ask for and are so substantial that simply securing the tubes to the vehicle frame supplements the anchor points already in place as part of the cooler mounting. You can't just plug in a cooler. Steps have to be taken to ensure the oil is not too cool. That means a thermostat has to be put into place which opens and closes the path to the cooler (in reality it closes off the flow only by about 90% to prevent consequences that can arise from a totally bypassed system). A variety of options are available, including inline thermostats that are placed in the middle of the tubing somewhere... but these require four additional fittings and, as you can see from the parts list below, fittings are not cheap. 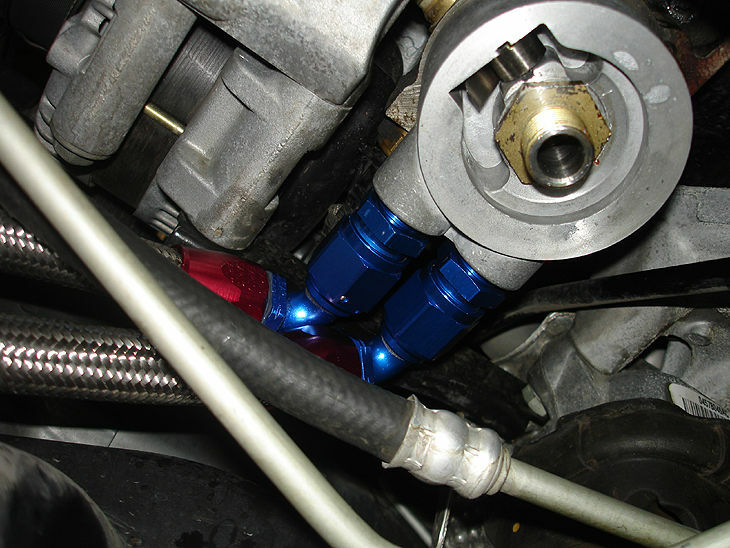 Also a potential solution is an oil filter relocation, which frees the physical space taken up by the oil filter for the thermostat and plumbing necessary to tie in the cooler. But this is only necessary if you have no extra room available. If you do have extra space to play with, a sandwich adapter with a built-in thermostat is the least expensive and simplest way to get the job done. As its name implies, a sandwich adapter is simply sandwiched in between the oil filter mount and the oil filter, which is about as simple it gets. However, for this application we did have to tap the 3/8 in. NPT inlet/outlet on the sandwich adapter more deeply so the fittings would clear a cross-member support that was crowding the whole assembly. This was by no means an inexpensive project. Elbow fittings - and swiveling ones at that - tend to be obscenely expensive. However, the level of protection it provides is indispensable. This entire project was sourced exclusively from Summit Racing. Prices may have changed since this writing. 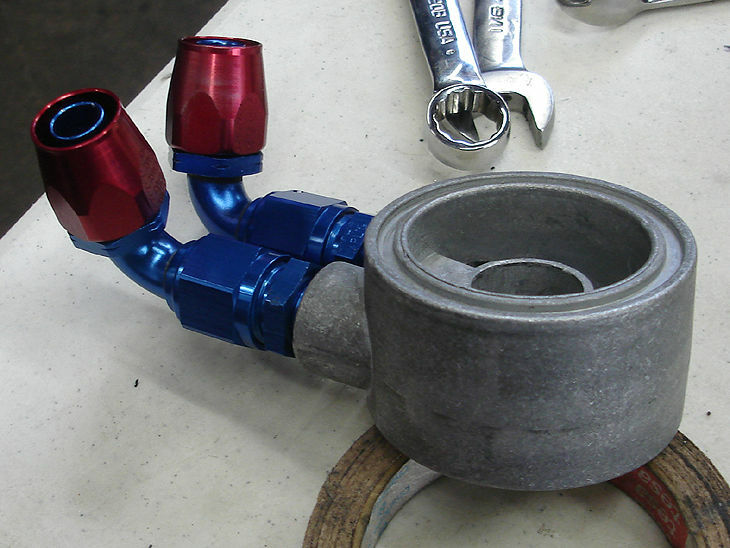 Note that since this project was finished in January of 2007, Summit has released a line of private-labeled fittings that can replace the specified Aeroquip parts for a respectable savings. The oil and transmission coolers were mounted behind the front grille, end-to-end, vertically. Discussions with engineers at Earl's Plumbing noted a concern with mounting the coolers by their lower 'ears' alone and, while the manufacturer sold mounting kits, those kits restricted airflow to the cooler and, frankly, were overkill. I found a much better solution at the local hardware store: All-thread, a few washers, some nylock nuts and a few strips of 2'' x 1/8'' aluminum strapping. Since the coolers sit end-to-end, there are four all-thread pieces that each run entirely through the ears of both coolers. nuts and washers fasten the all-thread to the coolers on both side of each 'ear'. 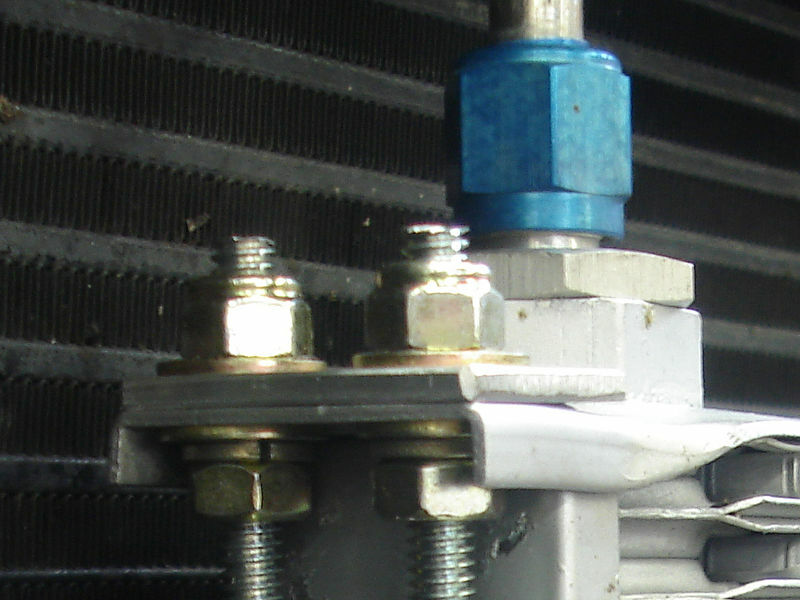 In fact, the inner nuts actually exert a bit of outward pressure on the ears to provide support to the cooler rather than allowing the outer nuts to clamp down on the ears. However, the nuts do not clamp down directly on the ears. Both the upper and lower nuts have a bit of aluminum strapping inserted between the washer and the ear, which distributes the force applied onto the ear. The end result is a rock-solid mount that does not put any undue stress on the cooler's structural integrity, yet still retains some 'give' thanks to the two additional pieces of aluminum strapping that mount both coolers behind the bumper. Note that even with this extreme solution, oil temperatures were still only just barely livable during extended track runs. 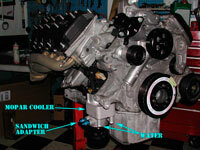 The solution was to add the Mopar Police Oil Cooler in addition to the stacked-plate solution. As in two oil coolers. The 'POC' taps into the radiator hoses and operates on the principle of heat exchange with engine water. This stresses the water cooling system accordingly, and partially explains why a beefed up radiator is also a part of the overall cooling solution. The two engine-oil cooling solutions together make for a car that has no issues running for extended periods on a race track, but the POC alone is an excellent standalone solution for the less-extreme LX driver. 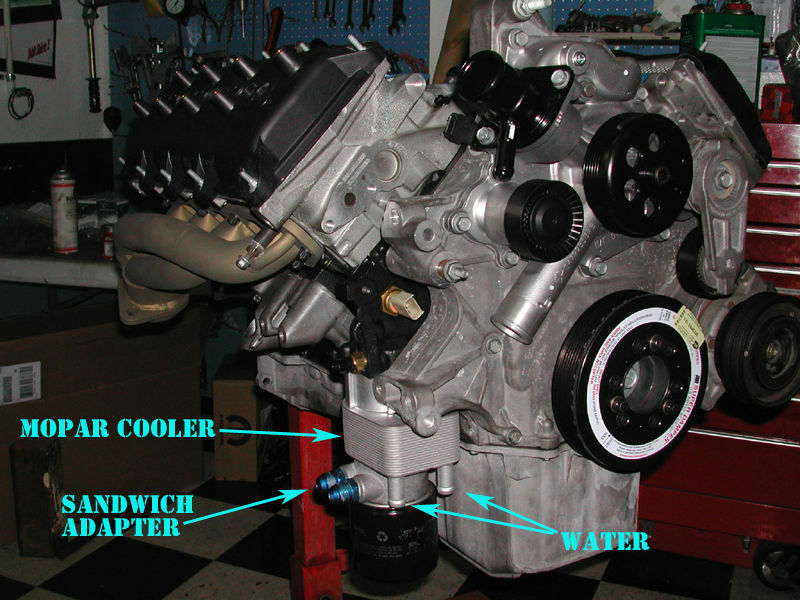 Since the Mopar cooler installs itself as a sandwich adapter -- and we already had one sandwich in place for the stacked-plate cooler -- there was concern that doing them both would not work, and it would be necessary to do an oil filter relocation. This turned out not to be the case. 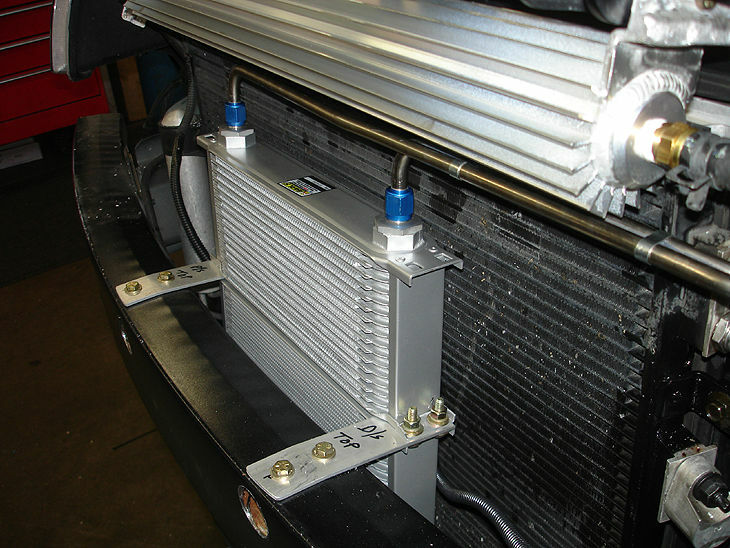 The two coolers stack perfectly well, and stay behind the protection of the engine cradle assembly quite nicely.